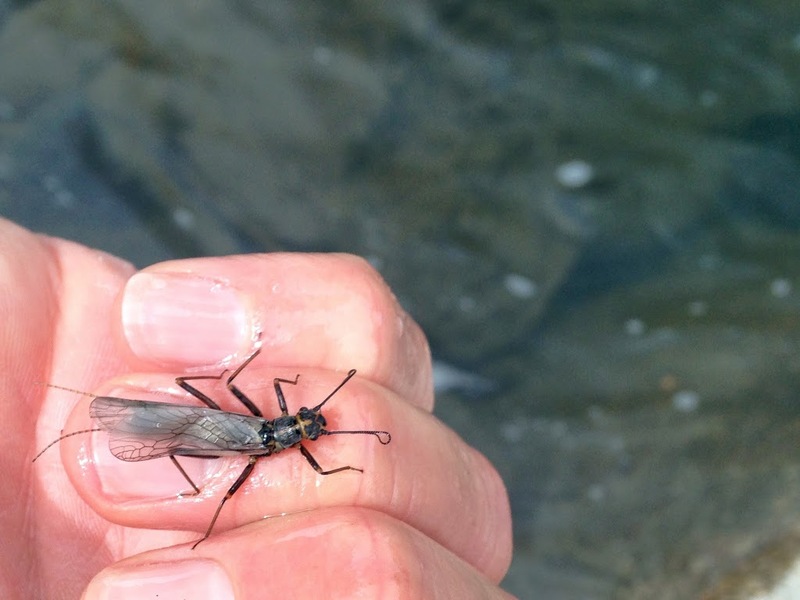 Baetis, caddis, stones are doing the heavy lifting. Days are either non-stop action or super slow with little in between. 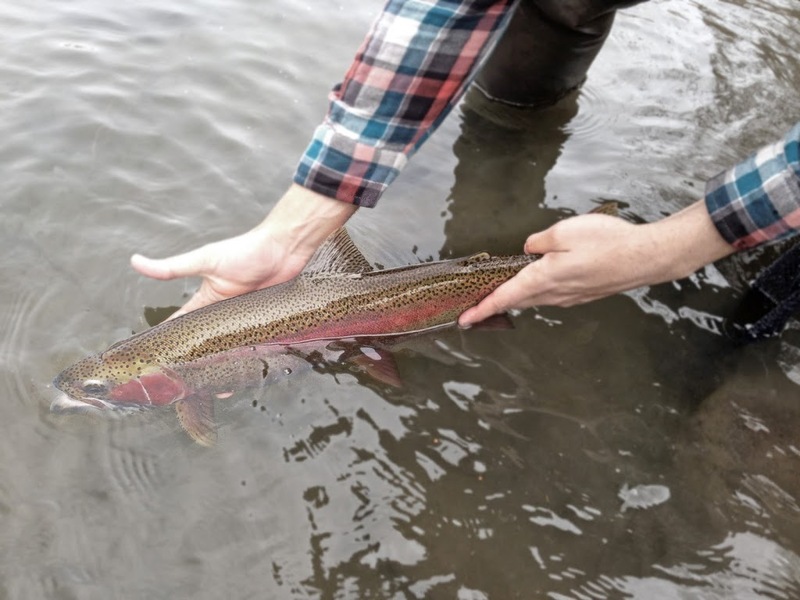 The rainbows have redds out so watch your wading. 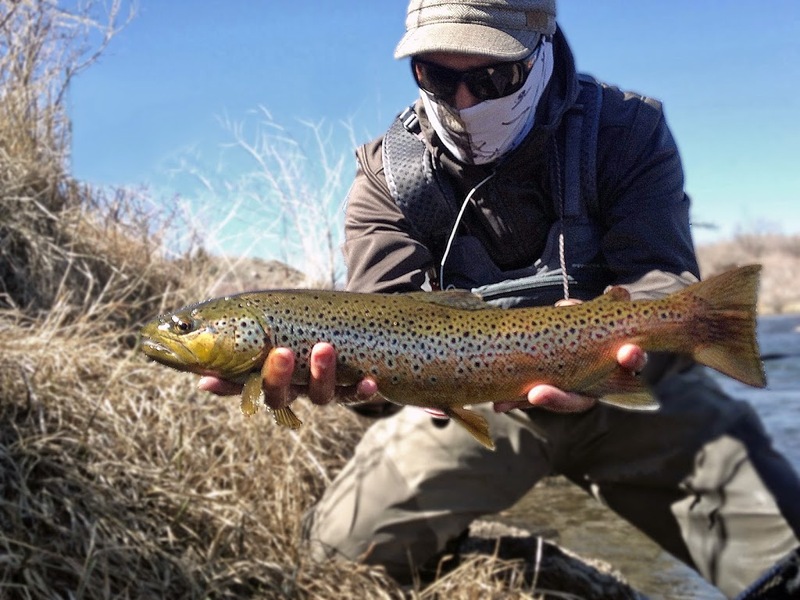 It took me several years to overcome my resistance to fly-fishing. 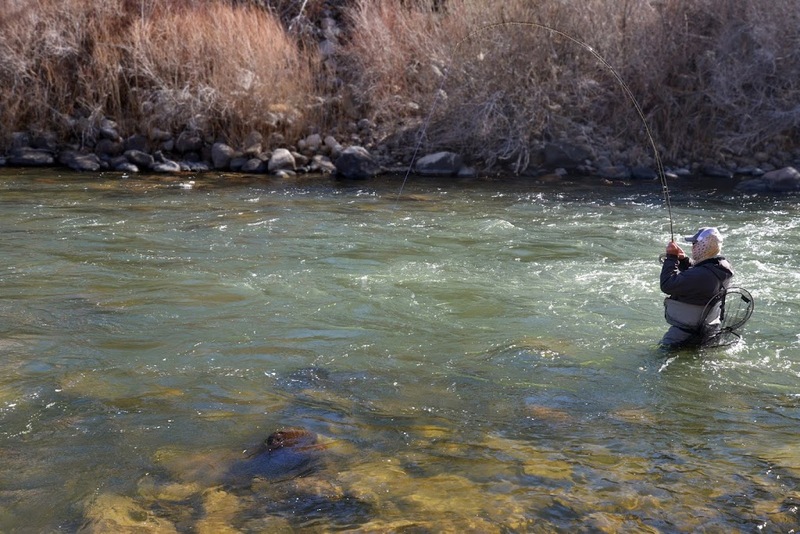 In the end, it wasn’t gear or access to great water that kept me from fly fishing earlier in my life. It was the prospect of starting over. I remember the day I realized that a skilled fly-fisherman could out-fish a skilled lure guy any day of the week. That’s when this hollow ache started in my gut. I was going back to the drawing board. This past week, I felt that same visceral heavy feeling rise up in me while out with Doug Ouellette. Doug’s a knowledgeable and personable guide and a generous friend so I welcome any chance to get out there with him. Even when Doug’s not teaching, he’s teaching. Though we both got into some good fish, his short-line nymphing was clearly obviously slightly superior that day to the hardware I was throwing under my indo-rig. He pulled a whole school of fish out from a run I covered first with my favorite stone and baetis combo. If you look closely, you can see Doug’s signature “Sweet Pea” hanging out of the rainbow’s mouth below. Admittedly, it’s a further leap from a spinning rod to a fly rod, than from an indo-rig to short-lining but it still requires a reset. I suppose if you want to move along in this journey we find ourselves in, you can’t buy a house on one approach. Best to rent a while and keep moving. Deviating from the tried and true is tough– I still feel that way still about swinging flies with a two hander. And it’s what kept me from stillwater angling for a long time… and, again, what kept me from chasing carp for many years. Fortunately it’s more fun when there’s endless opportunities to improve. Plus I think it’s more like building and addition on your house– or maybe just a bit of remodeling–you’re just adding another tool to the tool-chest, not ditching them all for new stuff. Well said. There is a reason why many of the worlds experts (who fish like 300 days a year) prefer the “tight-line” method. The indicator itself controls many aspects of the drift; tight lining puts the angler more in control. Although that means a lot of practice is needed in order to understand how to use that extra control to your advantage. Mike Sexton and Doug are some of the areas best. 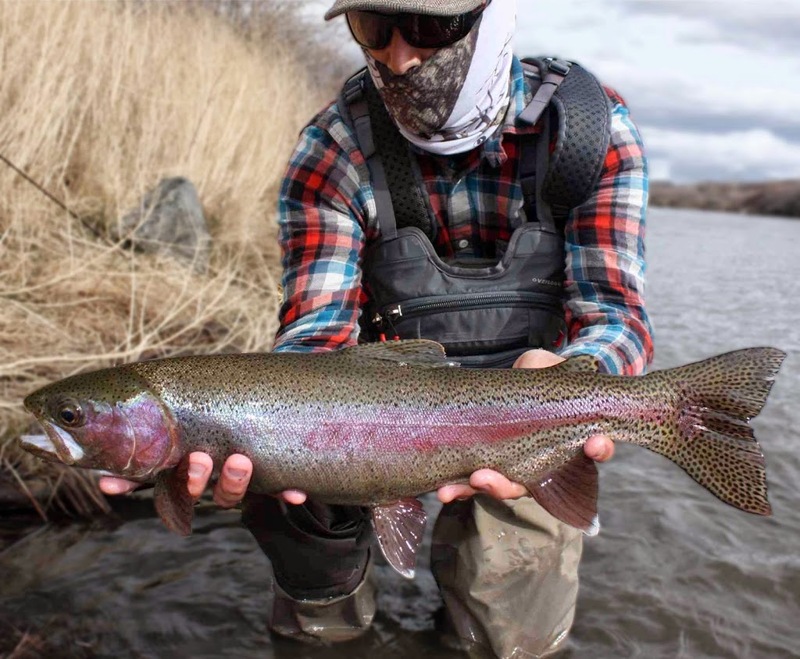 Though I have seen a lot of guys high sticking on the river that would probably catch more fish with an indicator….takes time. 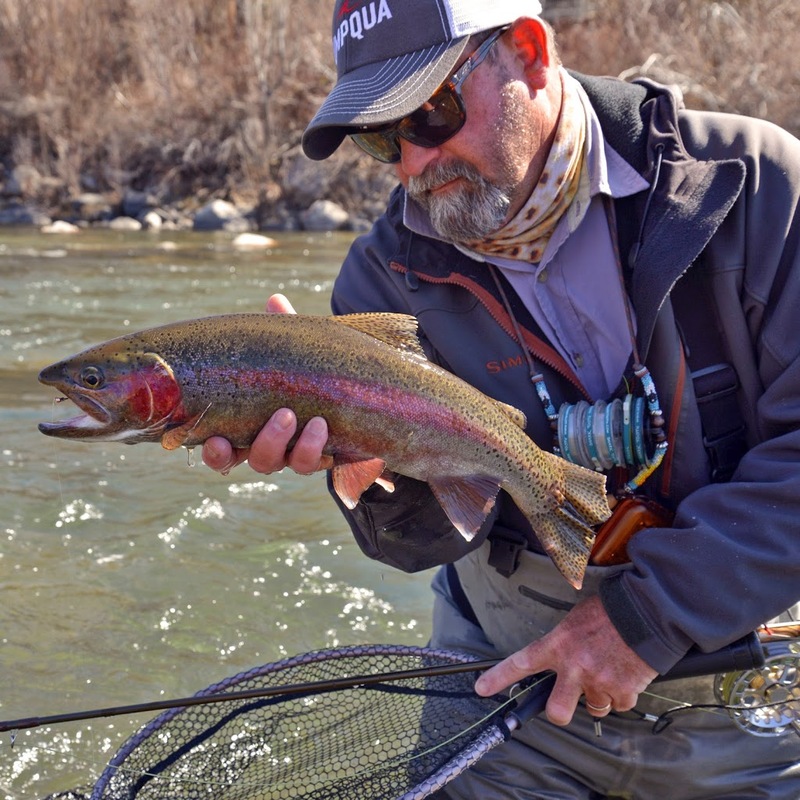 I still use the indo rig on the Truckee quite a bit, and there will always be a valuable place for it, but I have found high sticking to be an overall more productive way to go…especially on a river like the Truckee.